Spectrum has announced the release of two Arbitrary Waveform Generators (AWG's) that set new standards for speed, precision and size. The models offer one or two channels each capable of outputting electronic signals at rates of up to 1.25 Gigasamples/second (GS/s) with 16-bit vertical resolution. The combination makes these new AWG's ideal for generating high frequency signals up to 400 MHz with the best possible accuracy and fidelity. The frequency range and dynamic performance of the AWG's makes them of interest to engineers and scientists working in areas such as communications, radar, semiconductors, component testing, nano-technology, media testing, automation, ultrasound, optics, physics, medical and biological science. The AWG's can be used to generate almost any waveform, making them perfect for stimulating electronic devices like amplifiers, filters, receivers, and digital interfaces. As they can replay real world signals they can also be used to replace, or model, missing system components. Waveforms can be acquired from a digitizer or other instrument and loaded into the AWG via a number of popular file formats. They can also be created using mathematical equations or imported from third party software tools such as LabVIEW and MATLAB. More information abouts AWG's can be found on our AWG introduction page. Based on Spectrum's proven M4i series PCI Express (PCIe) platform the products are much smaller than conventional instruments and can be used in most modern PC's. 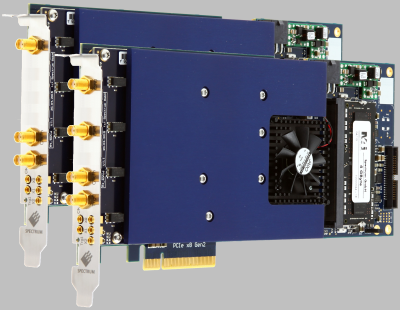 Simply install the AWG cards into a vacant PCIe slot, load Spectrum's software and start generating waveforms. The AWG's are fully programmable and work with Spectrum's own SBench 6 control software. Customers who want to control the AWG's with their own software can use the proven Spectrum drivers (available for Windows and Linux) that are included as part of the product. A set of standard programming examples illustrates the main signal generation functions and support is provided for Visual C++, Borland C++, Gnu C++, LabVIEW, Visual Basic, VB.NET, C#, J#, Python and Delphi code. To allow the generation of long and complex waveforms the AWG's include a generous 2 GSamples of of board memory and a number of operating modes such as Single-Shot, Loop, FIFO (streaming), Gated and Sequence Replay. In FIFO mode the cards use the ultra-fast PCIe x8 Gen2 interface to stream data continuously from the PC memory to the AWG at speeds up to 2.8 GB/s. If two channels are used the outputs are fully synchronized and share a common clock to ensure minimal phase error. If more channels are needed then up to 8 cards can be connected together with Spectrum's Star-Hub clock and trigger system. Star-Hub enables instruments with up to 16 fully synchronous channels to be created. Designed to output signals that emulate those found in the real world the AWG's deliver programmable output levels from ±200 mV to ±4 V into high-impedance (resulting in ±100 mV up to ±2 V into 50 Ω termination). Using 16 bit digital to analog conversion the AWG's also allow fine signal details to be generated. They deliver outstanding dynamic performance both in signal-to-noise (SNR), up to 72 dB, and spurious free dynamic range (SFDR), up to 98 dB. In addition, each channel is clocked using a precision phase locked loop (PLL) control system that can be generated internally or from an external clock or reference. The AWG's flexibility is further enhanced by front-panel multipurpose I/O connectors that allow access to asynchronous digital inputs and outputs, a time stamp reference clock, synchronous digital outputs, the trigger output, the run and arm status, the PLL reference clock and a marker output. The single channel M4i.6630-x8 and dual channel M4i.6631-x8 AWG cards are available with immediate delivery and are shipped factory tested with SBench6 base version software, support drivers and a 5 years manufacturer’s warranty. Technical support, including software and firmware updates, is available free of charge. Please contact info [at] spec.de for more information or visit our web site at www.spectrum-instrumentation.com where a number of AWG based product notes can be found.